The National Park Service is still in the midst of its yearlong bicentennial birthday commemoration of Frederick Douglass. Many books, articles, and journals have been written on Douglass—the leading African American abolitionist, orator, and statesman of the nineteenth century. 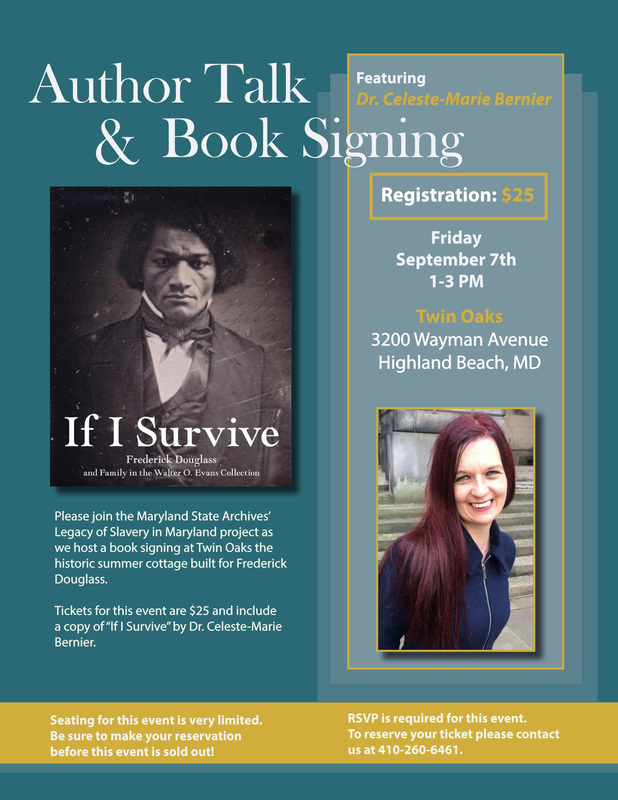 Historians and authors Celeste-Marie Bernier and Andrew Taylor have penned one of the newest books on Douglass entitled, “If I Survive: Frederick Douglass and Family in the Walter O. Evans Collection” published by Edinburgh University Press. The book is a collection of 60 previously unpublished speeches, letters and autobiographies, in addition to over 20 photographs and prints (many unseen) of Frederick Douglass and his sons from the Walter O. Evans Collection. This is the first extensive study of the great abolitionist and his family’s fight for the cause of liberty during the Civil War and in the Post-Emancipation era, as well as the first scholarly annotated transcriptions of these previously unpublished materials. We hope you can join us for this Book Discussion featuring authors Bernier and Taylor! Copies of the book will also be available for purchase in the site bookstore. This is the most important book in Douglassoniana Studies published in generations. Peace Islam to my dear friend William Alston El. The most important work of Douglassonian Studies published in the Bicentennial year of Frederick Douglass National Historic Site is published by our dear friend — our European friend — Prof. Bernie. I carry it how I carry it because that is how I was taught to carry it. We must recognize and acknowledge the importance of uplifting the truth of Dr. Frederick (Bailey) Douglass and his yet untold story. It is an American story that spans the Caribbean nations and across three continents. All these folks have it twisted and tangled. Therefore whereas there is opportunity for yung scholars to rise up out of their communities and tell the untold story. But there are no scholars. Just those running game. This is not speculative anti-history. This is annotated Douglassonian Studies. Family letters, biographies, photos, etc. The Douglasses can speak for themselves. And if Americans have to have a European scholar enlighten us to the ignorance of our history then so be it. How do you think we got Donald Trump? Learn how to uplift fallen history that is long overdue for this country and empower yourself to take ownership of your own history. Please consider joining us for this very special event! Seating is limited and is anticipated to sell out quickly. To reserve your seat and copy of the book please call 410-260-6461. Call for submissions for Ancostia Playhouse New Work Festival — DEADLINE FOR SUBMISSIONS IS AUGUST 31ST! 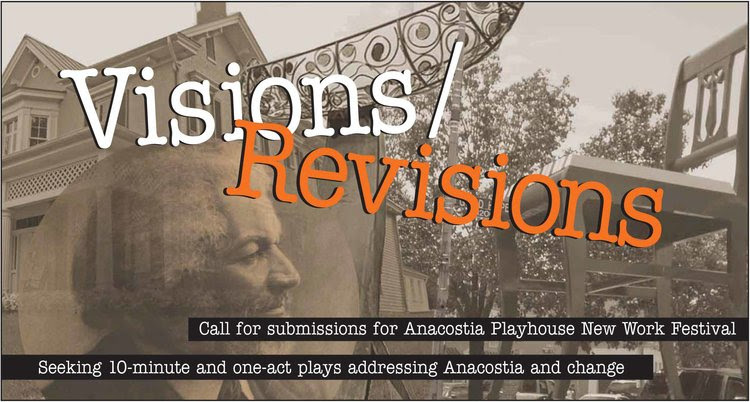 Anacostia Playhouse is seeking new and non-produced 10-minute and one-act plays for the 2018 New Works Festival: Visions/Revisions. Selected playwrights will have the opportunity to work with a professional director and actors to prepare for the final staged reading or performance. Submissions will be accepted June 5 – August 31, 2018. Submissions and payment must be submitted through the Anacostia Playhouse website using the form and payment button below. Please submit only new non-produced works. All plays must utilize a maximum of four actors (actors can play multiple parts). Before folks try to reach on me they should teach themselves who I be and from whence I come. I have done plays from time to time. My best friend and I were on the front page of the paper at 22 for our play about the 70. Folks can look it up. 4) In loving and forever memory of original Old Anacostia Douglassonian and community legend William Alston-El. In reviewing an advanced copy of Prof. David W. Blight’s Frederick Douglass: Prophet of Freedom I have come across a small, yet important and consequential, copy edit. While there are “Charlestons” in nearly two dozen states naming towns, cities, counties and a state capital there is no Charleston in Maryland. There is a Charlestown (Cecil County) and Chestertown (Kent County). If Prof. Blight is referencing a lost junction, town or city in Dorchester County I am unaware of its existence or its history. I would kindly suggest the appropriate correction is made. Geographic accuracy and importance of place matters to the good people on the Shore and in Tubman Country. Blight, David. W. Frederick Douglass: Prophet of Freedom. Simon and Schuster, 2018. I am not throwing stones from a glass house; I am lodging boulders from W Street in Old Anacostia. As a local journalist, I go to great lengths to fact-check my stories to spell names and places correctly, as well to get the facts right. In my book there is a copy error or two. It happens. I understand. Comes with the territory. For example, there is a mention of “Lewis Douglas” as Deputy Marshal when of course it is correctly “Lewis Douglass.” Additionally, I over-use the word intrepid in concurrent paragraphs. The expectation to get simple, rudimentary facts correct is not an unreasonable expectation. I can only speak for myself but every inhabitant of Pine Street, Bucktown and “Pindertown” I have had the acquaintance of making knows in their sleep the city closely affiliated with Harriet Tubman is Cambridge. With the continued recognition of the Frederick Douglass Bicentennial throughout the year join Washington, D.C.-based journalist and historian John Muller for a presentation beyond the common lore and mythology of Dr. Frederick Douglass. 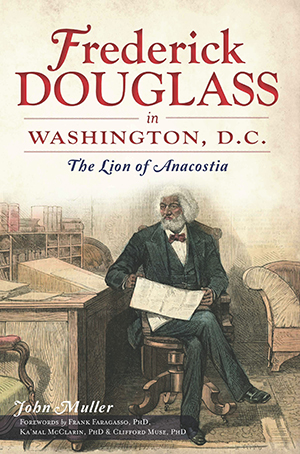 John Muller, author of Frederick Douglass in Washington, D.C.: The Lion of Anacostia (The History Press, 2012), will share largely unknown and previously unpublished material on the activities, experiences and relationships of Dr. Frederick Douglass and his family in Rochester and Monroe County, New York within the community of newspaper editors and journalists, abolitionists, reformists and educators. Learn how Douglass’ extensive Rochester network sustained him and frequently visited the Douglass family in Washington City. Additionally, Muller will provide updates on Bicentennial activities in the Washington, D.C.-Baltimore-Eastern Shore area. PowerPoint Presentation, Audience Q & A, books available for sale.